Time to rise… It is said that nothing is more painful than regret. 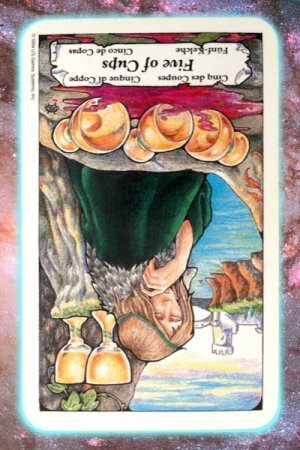 While this may or may not be true to your particular moment, it’s likely becoming apparent that you’ve done what you could to make sense and order from a certain set of circumstances. To what avail? What are you looking at now? Revelation. You see quite clearly that the cup, once spilled, cannot again hold what it had. The promise is gone from that particular offering. If you’re quite ready to let go of what you had pinned your hopes on, you’ll see that the new set of circumstances, more streamlined, more succinct, is waiting for you to take it on. Being ready to let go implies that you’ve finished your exploration of what turned out to be a dead end. Do you blame yourself for being misled? There is little to be gained from that. All you need to do is forgive yourself for having lost the plot somewhere along the way, and—whether through vice or anger—spilled what you had been looking forward to tasting. The truth is, you are now primed to experience the fullness of your hopes and dreams. The foretaste was preparing you for full appreciation of what is yet to come. And what’s coming is right around the corner. You’re closer than ever to fulfillment, and more ready to let go of what’s soured into disappointment. Find the sweetness in that. Look into your tried and tested life force, past the exhaustion, past the jadedness. The pure divine essence at your core is more accessible now. You’re just about ready to find a deeper experience of faith, and just in time. Your inner authenticity can’t wait any longer to show itself, and the world is ready for that. Just as you’re ready to let go of what no longer can be, you see that there is little choice for you but to step more fully into that authenticity. You can see the writing on the wall. Instinctively, you know it’s time to let go of what cannot hope to truly fulfill you. Instinctively, you’re already reaching for what faith is telling you is there. It’s no longer out of reach. Stretch those inner structures that have been too long trained on disappointing futures toward a higher direction, a deeper degree. You’re about to claim what’s yours. With that comes unencumbered integration. Time to rise and shine.